The BCG (named after the Boston Consulting Group) Matrix, is a strategy analysis tool which helps to understand the strategic options available across a portfolio of different business units, products, services, customer segments or channels. The model shows that not all parts of a portfolio business are strategically equal, and in so doing helps to facilitate more nuanced strategic analysis. The resultant portfolio analysis can then be roughly divided into 4 quadrants, as shown in the chart to the right. Stars: continue to invest for growth. Question Marks: decide to invest or exit. 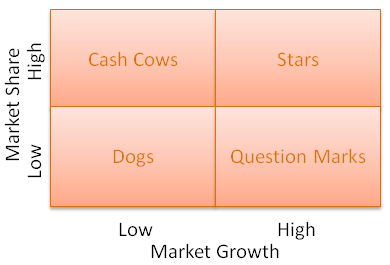 For example, Cash Cows may more readily lend themselves to "Competitive" strategic thinking (see for example Porter's 5 Forces Analysis), while Stars may lend themselves to more "Blue Ocean" strategic thinking (see for example The Strategy Canvas). You can read more at Blue Ocean vs. 5 Forces for further insight into this subject). In addition, one could vary the size with which you plot each source of value to represent, say, profitability. How you define the scope of each market (for measuring market share and growth) is key to the placement of each source of value. Don't ignore cross synergies, for example, taking into consideration sources of value which may serve as loss leaders. When considering the allocation of costs across sources of value, remember that all costs are variable in the long term. That is, don't think that you need to keep an unprofitable product, channel etc. going just because it is absorbing some of your "fixed" costs. You can now do a BCG Matrix using StratNavApp.com - the free online, interactive, collaborative tool for strategists. The example below was prepared using StratNavApp.com (click on the image to enlarge it).